One community of lifelong learners, engaged in creating our culture, where all are safe, valued and accountable to one another for success. Expect excellence, grounded in compassion, to meet the needs of all learners. April 2019 - This month Mrs. Dawn Waller-Lueck and Mrs. Emily Cassellius share the district wide STEM program. The second session is Ann Riebel, the Early Childhood Family Education Coordinator and she shares how the district support families with young children. March 2019 - Announce new Building & Grounds Director and update on referendum projects. February 2019 - Kindergarten and early childhood opportunities. January 2019 - This episode highlights the Foundations for Winona Area Public Schools fundraising event and the Dare to Dream Grant winner Jen Snook! December 2018: Superintendent Mr. Rich Dahman highlights next steps for the bond referendum and talks with Winona Teacher of the Year Mrs. Theresa Pearson. November 2018: Superintendent Rich Dahman interviews WSHS W Club and WSHS Drama Club. October 2018: Superintendent Rich Dahman and Sarah Slaby, WAPS Fiscal Affairs Director cover the Bond Referendum 2018. Rich welcomes Tammie Townzen, WAPS Transportation Coordinator. September 2018: Superintendent Rich Dahman highlights 17-18 accomplishments and talks about 18-19 goals. Rich also introduces new Director of Learning & Teaching and Director of Special Education. June 2018: Superintendent Rich Dahman speaks with graduating seniors about their future plans upon graduation. May 2018: Superintendent Rich talks with Patti Darbo about Work Experience Program and Mark Anderson discusses school safety. April 2018: Superintendent Rich talks with Tech Nest student Ethan Larson and Technology Integration Specialist, Jeremy Graves. Second sessions we meet kindergarten teacher Mr. Norman and principal Mrs. Eisner. They catch us up on where students should be when they enter kindergarten and the skills they learn by the time they move to 1st grade. 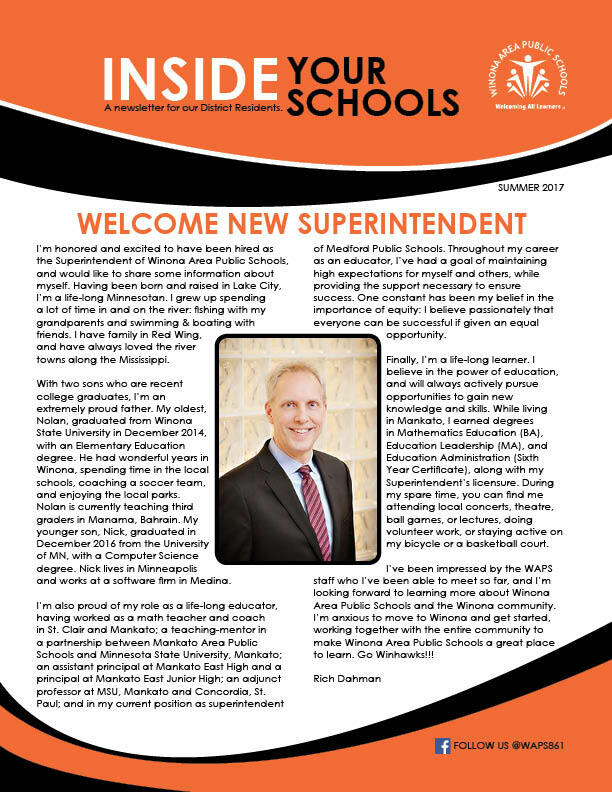 Winona Area Public Schools distributes a community newsletter call "Inside Your School" three times a year. This newsletter is delivered to all residents and provides an inside scoop of our schools and presents challenges and celebrations. For questions, comments, suggestions for articles, please contact Inside Your Schools Editor. School start times and bus pickups will be two hours after regularly scheduled time. Key Kids will provide care for families enrolled in snow care. Students will be bussed from the Central site to their schools. Breakfast will be served at the Winona Senior High School but will not be served at Winona Middle School, Winona Area Learning Center or any of our elementary schools. Morning and afternoon preschool is canceled at Goodview along with morning preschool at Rollingstone. ECFE classes scheduled before 10:00 a.m. will be canceled. Any classes that begin at 10:00 a.m. or later will go on as scheduled. NO Key Kids care on early dismissal days. Parents will need to pick up their child(ren) at school at the time of dismissal. NO afternoon Community Kids Preschool, ECFE classes, after school activities, afternoon or evening Community Education/Adult Literacy/GED/ ESL/ ABE classes. Key Kids will provide care at Winona Middle School on full snow days for families enrolled for snow care. Care will be provided at the Middle School, 1570 Homer Road. Community Education events/classes, including ECFE, preschools, Adult Literacy, GED Testing, Adult Enrichment, Project COMPASS, After School Activities, etc. Many of the school district’s administration offices are open regardless of the weather. Call specific office for more information. Weather related messages are sent from Infinite Campus through email, text message and automated phone calls using current contacts listed in the Infinite Campus Parent Portal. To review contact preferences follow the simple steps below. Log in. If you need to create an account, re-set your password or if you have questions, email portal.help@winona.k12.mn.us. If you are a district parent and would like to sign up or have questions, please e-mail portal.help@winona.k12.mn.us with your question(s) or to request an activation key. The activation key will allow you to create your Campus parent portal account. Tune in to WAPS Facebook and area media stations (radio/TV) for the latest on any school closing information.